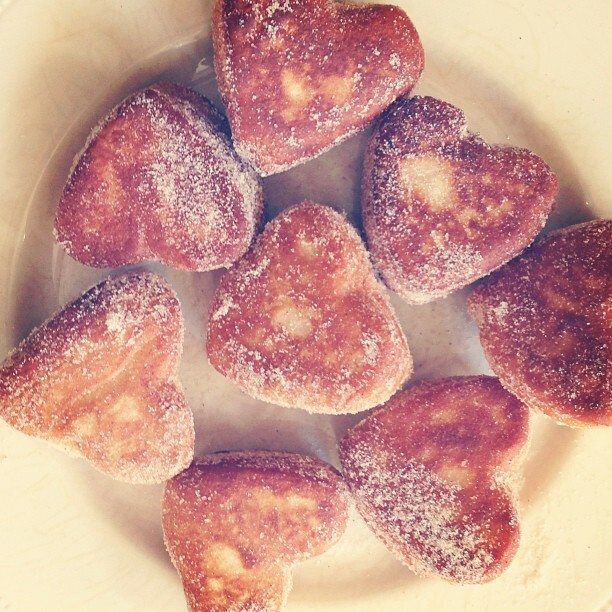 Over the weekend I made cinnamon sugar donuts as a special treat. All you need is a can of Grands biscuits, oil in a frying pan, and a mix of cinnamon and sugar. Valentine's Day may be over, but I'm not ready to ditch the heart cookie cutters just yet. I didn't take a picture of the pan of oil, but the next step is to heat the oil over medium heat. I put in enough to be about a half inch deep. Cranking the heat up to save time doesn't really work, it just burns the biscuits, so stick with medium heat. The oil is ready when a splatter of water bounces back. Then just gently place a few donuts in the hot oil and fry them. Flip them with tongs when they are brown. The process goes REALLY fast...so only do a few at a time and don't look away!! After they're brown on both sides, take them out and let them sit on a few paper towels while the others are cooking. Pour a little sugar and cinnamon in a big Ziploc, put your donuts in, and toss them in the sugar mix until they're pretty well coated. And that's it...warm, sugary donuts made fresh at home! Looks wonderful, I can almost smell them! I just came across your blog! I'm glad I did! the sugar donuts look so delicious! Glad to see you carrying on the tradition--with your own twist! Heart shaped everything! I approve :) Very cute post! thanks for the idea!